With the large screen real-estate that the iPad offers, I wasn’t really quite surprised that the first adopters among application developers would be those with mobile Twitter client apps. If you checked the iTunes iPad App Store right now, you’d find several Twitter apps for the iPad – both new and old ones ported to the new platform. One of these Twitter apps which happens to be also my favorite on mobile phones is TweetDeck. Thankfully, the TweetDeck folks didn’t just ported their mobile TweetDeck app to the iPad platform but build a new application instead. In fact they’ve build two new interfaces – for portrait and landscape modes. TweetDeck for iPad also takes full use of the device’s multi-gesture features. 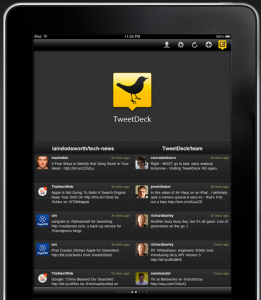 Feature-wise, TweetDeck for iPad lets you do practically everything that you can with its mobile phone versions. The app lets you fully manage all your Twitter accounts, check web pages from within TweetDeck, use columns to manage your real-time feed, sync your data with the desktop and iphone client, iPad gesture based navigation, geolocation data and map interface, and of course all the basic Twitter functions such as composing tweets, retweeting and sending DMs. And guess what? TweetDeck for iPad is a free download. Get it from the iTunes iPad App Store once you received your iPad. Or watch this video showing the TweetDeck for iPad in action.